she will have nowhere to run and nowhere to hide. A sailor hangs himself on board a naval submarine. Although ruled a suicide Lieutenant Danielle Lewis, the Navy's finest Special Branch investigator, knows the sailor's wife was found brutally murdered only days before. Now Dan must enter the cramped confines of HMS Tenacity to interrogate the tight-knit, male crew and determine if there's a link. Standing alone in the face of extreme hostility and with a possible killer on board, Dan soon realises that she may have to choose between the truth and her own survival. Despite getting off to a slightly slow start, plus an incredibly engaging prologue, Tenacity soon ramps up the compulsiveness of reading, with its claustrophobic setting and no clue how on earth it would turn out. It's the location of this book that is the stand out and what attracted me to the book in the beginning. It is not often you get a book set on a submarine, written by an ex-Navy person. It is even rarer to be able to read a chilling murder and having just a singular Lieutenant carrying out all the interviews while the submarine is submerged, but that is exactly what is to occur on the HMS Tenacity. What makes things tougher is that Dan is female, and women are not generally submariners, and its a very close knit male community on board, as it has to be with the the ships company able to close ranks and make life very uncomfortable should they choose to. 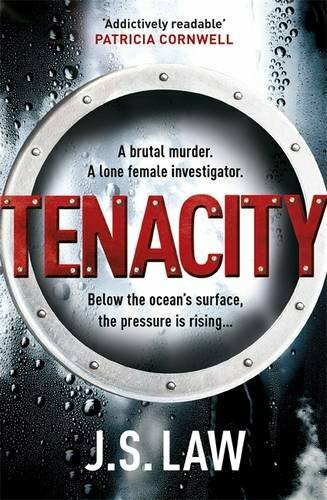 Now factor in that some crimes have been committed and the death count is at two, and Dan is alone beneath the ocean with a potential murderer, and no escape, and you get just a small feeling of what it is like to read Tenacity. Right near the start I predicted what I thought would happen, and for a while, until the book got going fully, I was convinced that I would be right,, and then Dan boards the submarines and all my thoughts of predictions go out of the window, and I was completely wrong anyway. Dan Lewis is a determined investigator who works mainly on gut feeling. She is gutsy and highly intelligent, but has issues trusting people, and her last big case was one huge nightmare. Seeing her attempt to deal with life on a submarine, when her treatment isn't the best, and the sense of isolation, was made so clear with the writing, I really felt for her. Tenacity is an immersive experience, its compulsive with its need to make you turn pages, and to keep going. I am so impressed by this debut novel and am eager to see where the Dan Lewis series goes next. Thank you to everyone that voted for Tenacity. It had been very tight, and I had to recount a few times to make sure I had counted it all correctly. I would also like to thank Headline for the Crime Rooftop Book Club where I met J.S. Law and it was listening to him, that made me want to buy Tenacity, so I'm just grateful all around my gut feeling that this was book worth reading, was in fact correct.